So, you want to be able to see your instruments at night? Firstly one needs to understand how the Td5 instrument packs differ from the older ones. 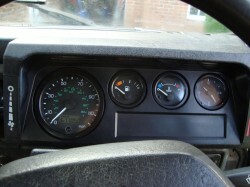 The gauges are entirely electronic rather than the cable-driven speedo of days gone by, and the lighting also is much improved being properly backlit, to the extent of even the heater controls being lit. The conversion is reasonably easy, but does require a basic knowledge of wiring (how to crimp on non-insulated terminals properly etc.) to complete. Parts are not massively expensive, although of course it depends where you buy from. Gauges are always popping up on eBay now and then, as are the other instrument parts required, although the easiest way to do it is to just buy a complete Td5 instrument pack including the binnacle, all the gauges/dials, the warning light panel and the loom. Some basic wiring tools and bits, crimpers, tape etc. The main involved part of this procedure is the adaptation of the Td5 water temperature gauge to the 200/300Tdi engine. In a standard Td5 the gauge receives its signal from the ECU, and so if you take the signal from the temperature sender in the thermostat housing directly to the gauge it will not read correctly, even with the correct (AMR1425) sender in there. To get around this we make use of a handy feature put into the speedo by Land Rover (and VDO who made it). 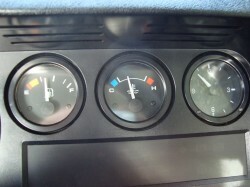 Because Land Rover kept producing 300Tdi-equipped vehicles up until a few years ago (ROW spec), but equipped them with the modern Td5 dash, there is a built-in way of making the 300Tdi temperature sender work with the Td5 gauge. 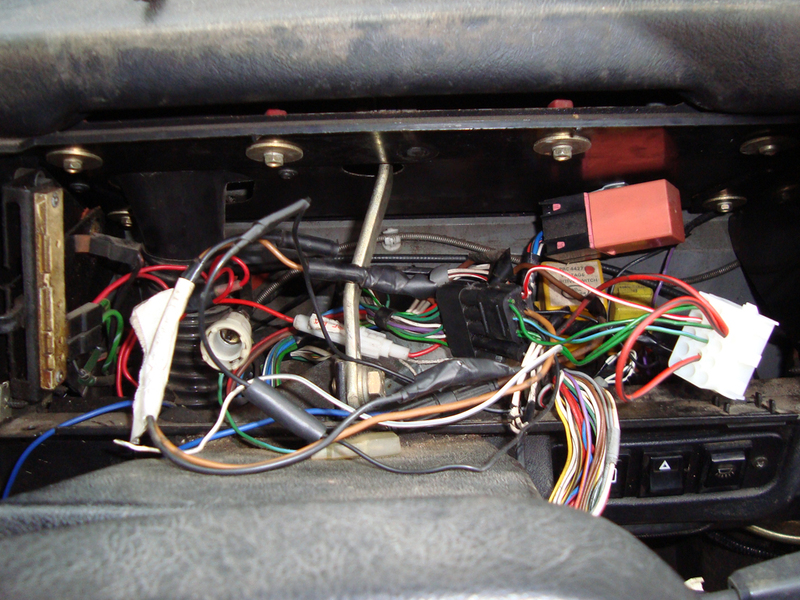 This involves slightly re-routing the wires in the dash loom, hence the need for some extra pins in the lower speedo plug. For this guide, I will go through the steps required to achieve this second option. It’s worth noting that you can actually buy a loom with this mod pre-done, it’s known as a ROW-spec dash loom (YMG109260) but they’re not cheap, if you can even find them. 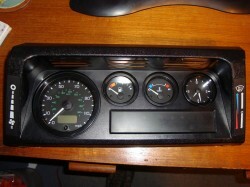 The other option of course is to not bother with the Td5 temperature gauge at all, and instead fit an aftermarket one. The VDO Vision range is very popular, and matches the other Td5 gauges well. In this instance, you will not need the temperature gauge, 300Tdi sender, or extra speedo plug pins, and will not need to modify the loom as set out below, but instead need to obtain a matched aftermarket gauge and sender pair, as above. Bear in mind the sender thread, I believe the 200Tdi is a 5/8” UNF thread and the 300Tdi is 1/8” NPT. As can been seen from the diagram above, most of the connections are to be made at the large multi-plug (which we will be replacing later on). The only work that needs doing within the loom is re-routing the temp sender feed to go via the speedo head before going to the gauge. Okay, let’s get started. First task is to modify the Td5 loom. The lower speedo plug, as referred to here, is the one with less wires on. It is the lower one on the back of the speedo if held in the correct orientation. Open up your dash loom, now you need to take the Light Green/Blue wire that currently goes from pin 8 on the large multi-plug down to pin 2 on the temp gauge connector, and move the multi-plug end to pin 9 on the lower speedo plug (you can just cut the multi-plug end, as we’ll be changing it later). Cut the wire to the correct length, and then you will need to crimp on one of your new speedo plug pins. It should now go from pin 2 on the temp gauge connector to pin 9 on the speedo lower plug. 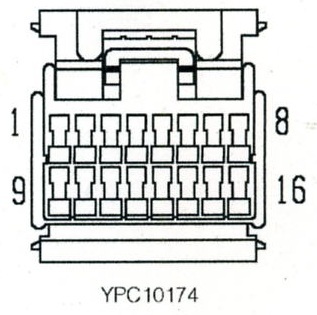 This can be seen on the diagram, marked as Light Green/Blue (LGU). To add/remove pins to the pink speedo plugs, you will need to remove the yellow locking strip that should be visible from one end. Replace it once you have finished the modifications later on. Now take some new wire of the same gauge (ideally Green/Blue), and crimp on one end one of your new lower speedo plug pins. 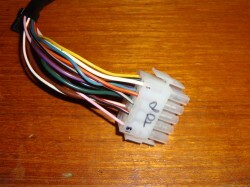 This wire then needs to run from pin 5 down to where pin 8 was on the multi-plug connector. Leave this un-connected for now as we will be changing this plug later. 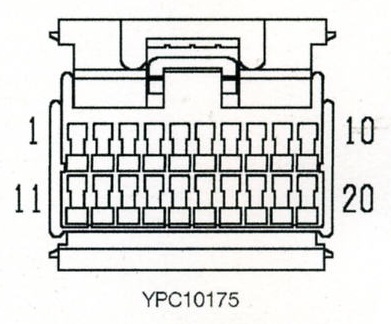 To double-check, the feed for the temperature sender should come in on pin 8 of the multi-plug (or where pin 8 was) and then run up the loom into the lower speedo plug on pin 5. It should then exit this plug on pin 9, and run to the temperature gauge, where it enters on pin 2. Check yours against this and the diagram. Twice. And then again to be sure. 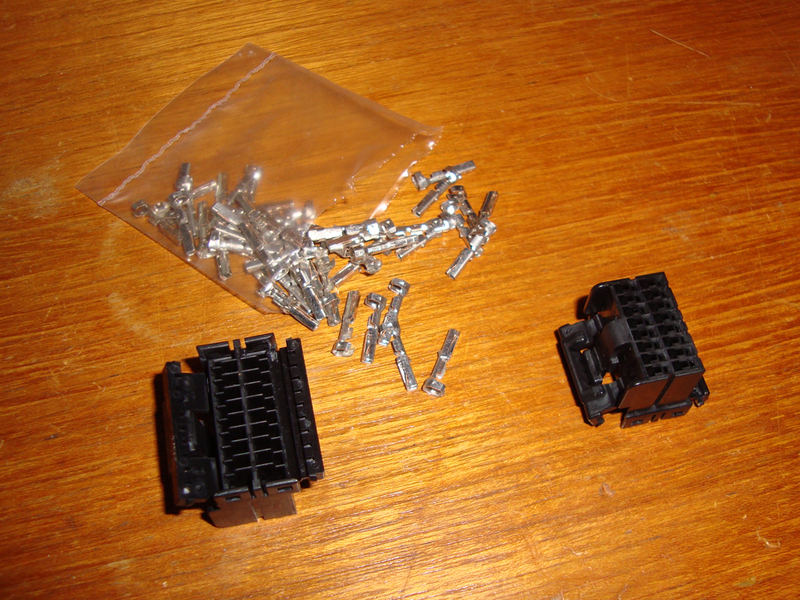 The next stage is to remove the grey multi-plug connector from the end of the loom and replace it with one half of the multi-way connector pair you bought. It will be easier to do this if you remove the loom tape (which you should have done anyway as above), and do the connections one at a time. That way you can make sure that the pin numbers stay correct and as per the diagram. 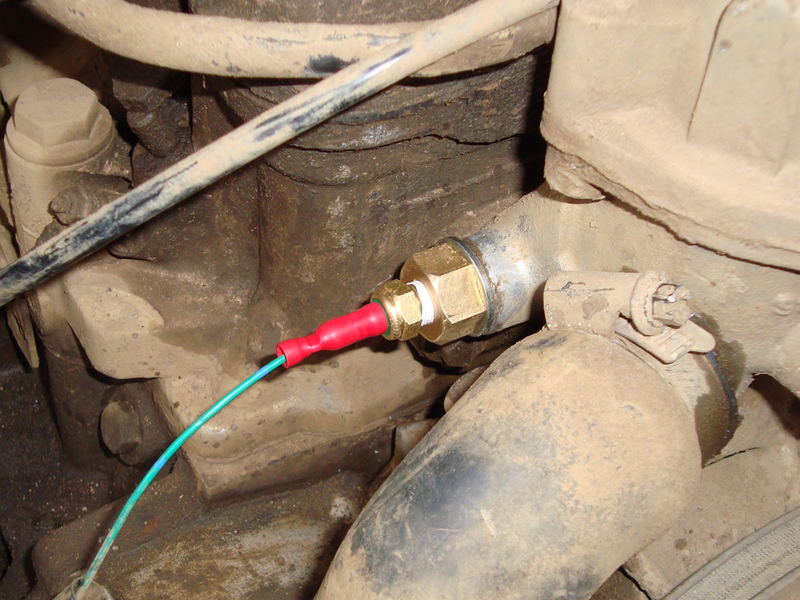 Of course, as long as each wire matches up with its correct partner on the vehicle then it doesn’t really matter, but it makes diagnosis easier if you keep to the diagrams. Now the loom modification is complete, the next job is to do some of the dirtier bits, in the engine bay and under the vehicle. For the temperature sender you can re-use the existing wire, just fit the correct sender into the block. 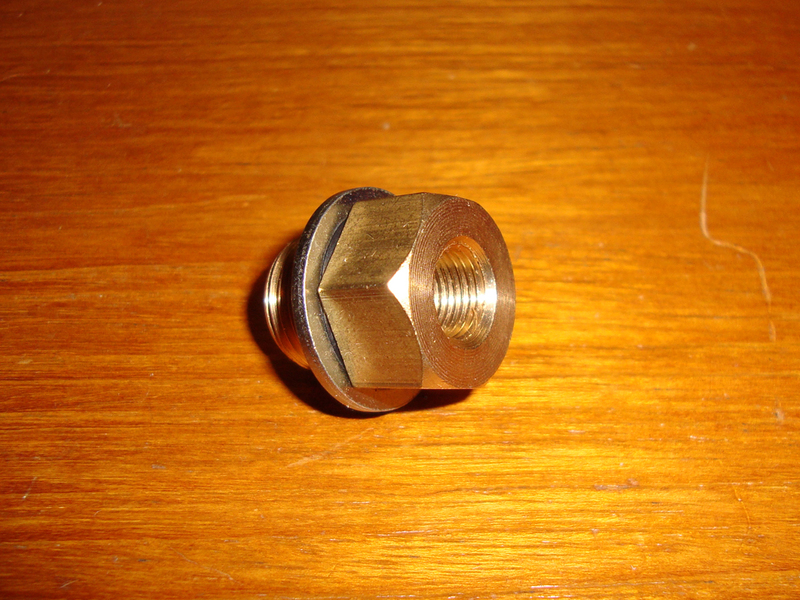 If you have a 300Tdi, then the correct sender (AMR1425) will fit straight in, however if you have a 200Tdi then you will need to purchase or make an adaptor to take the 5/8” UNF thread in the block down to the 1/8” NPT for the correct sender. This can be made by boring out the inner of your old 200Tdi sender and tapping it to 1/8” NPT, although I’ve not done it that way myself. I (lazily) bought an adaptor from http://www.europaspares.com/, although Vehicle Wiring Products also supply them as part of one of their ‘Brass Adaptor Kits’ (part number 52399). Now for the speedo transducer. 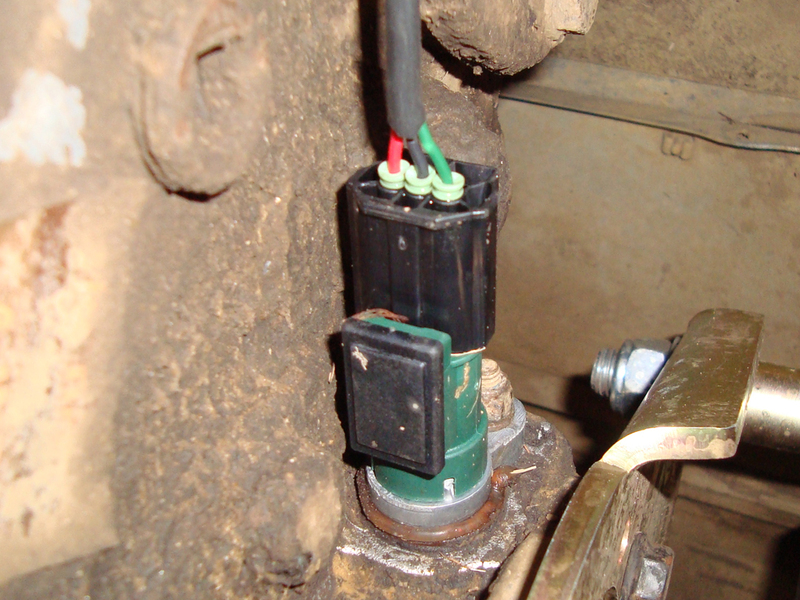 You need to remove the old drive cable and its end fitting which will currently be residing in the nearside of the transfer box behind the parking brake’s back plate. Remove both and run your new 3-core wire in place of the old drive cable. 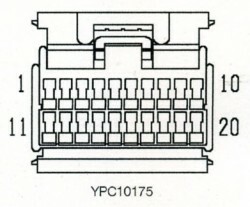 On the end of this cable, attach the 3-pin plug as per the diagram, ensuring the wires are the correct way around. Fit the transducer in the hole (ensuring the drive is correctly aligned), and attach the 3-core cable as per the diagram. The other end (dash end) of the 3-core cable will need to be wired into an ignition switched live, ground, and the multi-plug when the time comes to it. Having a 3-core with different coloured wires is helpful here. 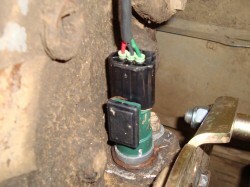 Transducer installed in side of transfer box. 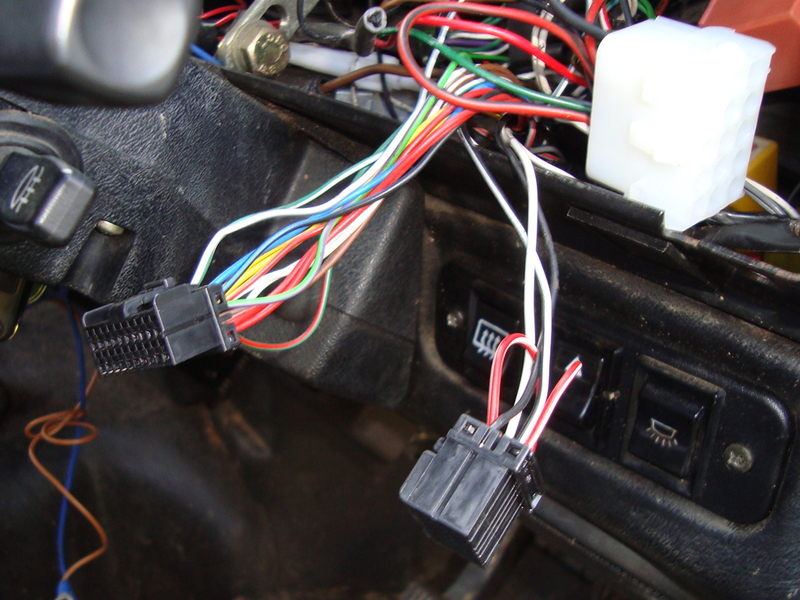 I used red for ignition switched live and green for the speedo signal, but as long as the pins match up on the diagrams the wire colours are irrelevant. The third task is to wire in the second half of your multi-plug, remove your instrument binnacle (if you haven’t already done so) in order that you can get to the wires behind. Again, if you haven’t already then fit the new gauges to the binnacle now whilst it’s out. 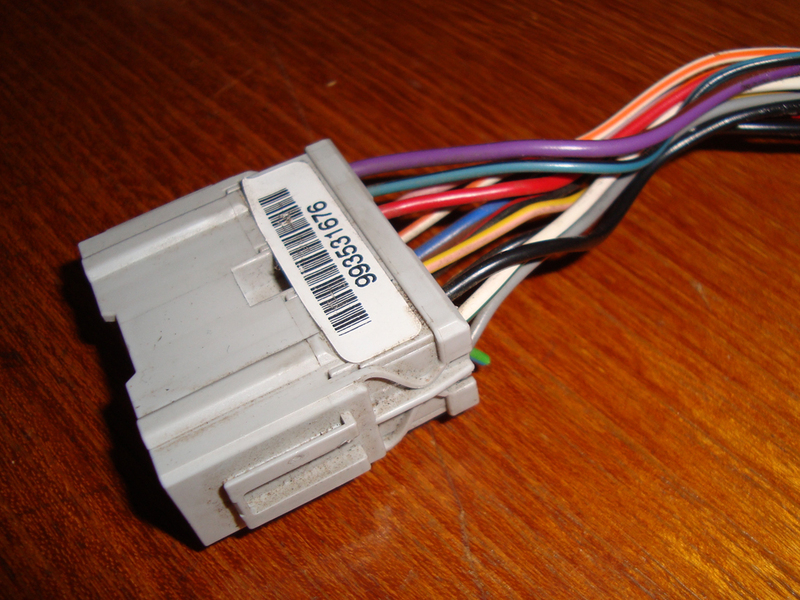 One 12V ignition-switched feed (pin 1), this should be fused to 10A. 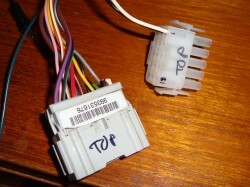 Two permanent 12V feeds (pins 6 and 11), both fused to 5A each. Several earths (pins 2, 7 and 9), these can be combined to a decent earth point on the bulkhead behind the dash. 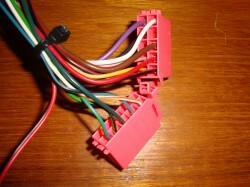 The above needs to be wired into the other half of the new multi-plug, ready to attach to your newly modified dash loom. Make sure to check and double check that the wires all match up on both sides as per the diagram. You don’t want to put the wrong voltages down the wrong bits and ruin your new gauges. The Td5 time clock just plugs into the loom on the plug designed for it. If you have a voltmeter or something else to go there instead then just leave this plug loose. 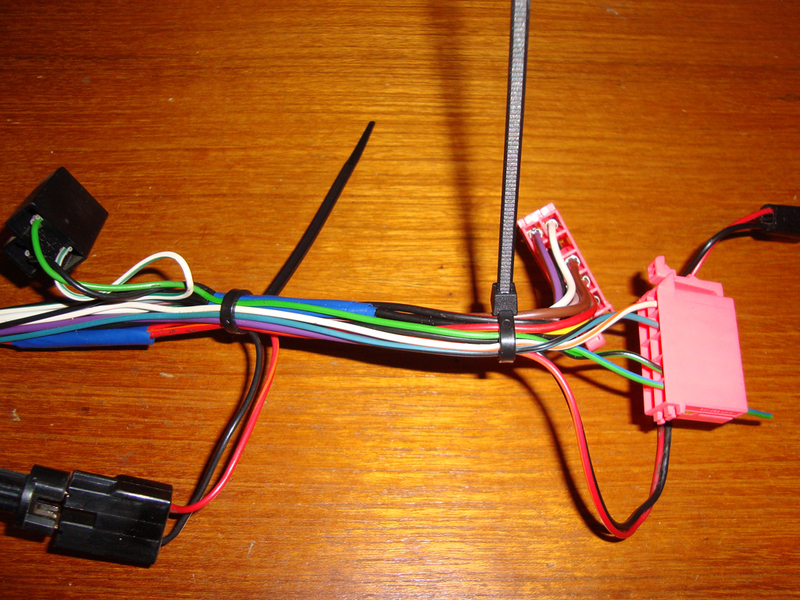 Once you are happy with the wiring, connect it up and give it a test. You will need to get the engine warm to test the water temperature gauge of course, but for the fuel gauge just check that it climbs to the same level that it did on the old one, and then keep an eye on it next time you fill up. 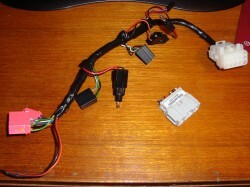 The low-fuel light (if you have one) can stay connected straight from your sender, you don’t have to use the wire from the speedo for it. 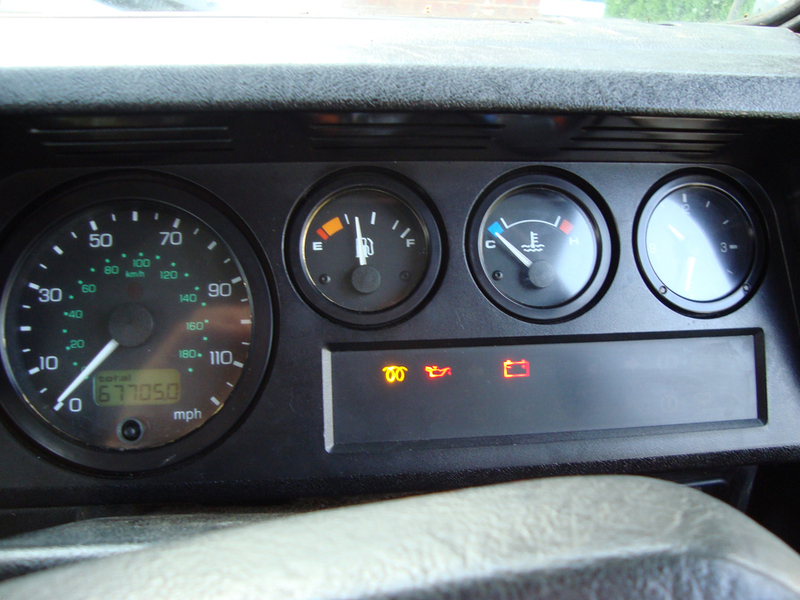 However, if you wish to then simply take the feed from pin 1 on the lower speedo plug to the relevant wire on the warning light panel. This is what I did, in conjunction with the new panel, as detailed below. 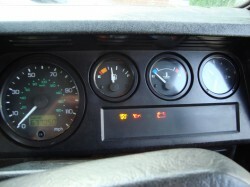 My last job was to alter the mileage reading on the speedo. In theory you could set it up on the bench with a power drill and wait…but I opted to take the speedo to Digidash, who changed the reading for me at a reasonable cost. I then fine-tuned with the drill to get it to the exact reading on the final day of fitting. With any luck, you should now have a fully functional Td5 gauge setup. If for some reason you can’t get it to work then check and double check your wiring for errors or omissions. That said, the diagram I have drawn is what worked for me. Land Rovers being how they are, it’s not beyond reason that something could be different on yours, especially if it’s a foreign or different spec. vehicle. Now, at this point you can leave the upgraded gauges fitted into your existing Tdi binnacle and be happy as larry, and I’ll note that it is worth doing this and just checking over a few days that everything works as it should, before doing the next part which is adding the Td5 binnacle and warning light panel. First step here is to remove your old binnacle, undo the retaining screws, ensure everything is disconnected behind, and pull it clear. It’s very important here to label which warning light each wire came from when removing the wires from the warning light panel. This will make identifying them when wiring them into the new panel much easier. The next and unfortunately quite arduous task is to wire the existing vehicle’s wiring into the Td5 warning light panel. 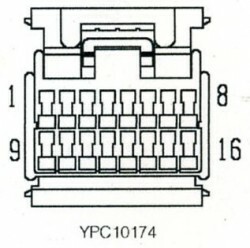 Below are the pin-outs for the pins on the two plugs, showing what circuit each pin connects to. For most of the connections, it’s simply a case of wiring the existing wire from the vehicle into the correct pin on the correct plug. The indicator feeds can be run to the separate left and right icons rather than both terminating on the one symbol as per the pre-Td5 setup. There will be several unused lights in the panel, and you can use them for any purpose you like (a low coolant level sensor, winch power indicator etc.). To facilitate this, you will need to either connect the lamp to a 12v supply or an earth (switched via your device/sensor of course), depending on the lamp. In the table below it shows which require an earth to illuminate and which require a 12v supply. As can be seen above and in the wiring table you have to link some of the pins across onto one another on the smaller plug. This is a workaround for non-ABS vehicles and stops the light being on all the time. Plug the multi-plugs into the back of the warning light panel, and refit your dash. You should now be able to give all the circuits a good test, checking that everything still works as it did beforehand. That should be it! Okay, so now with any luck your gauges and warning light panel should all be fully functional. If you have any problems, the obvious thing to do is check your wiring again against this information, however the information posted here is what worked for me and what I have heard worked for others…due to Land Rover’s unique ability to mix-and-match vehicle parts it is by no means guaranteed to work for you. For example, the colours didn’t quite match the diagrams in my vehicle, I think because of silly previous owners. That said, there is always a way around the problem. I want to thank the good people over at the LR4x4 forums, special mentions go to Mo Murphy, Western and Diesel Jim as these guys are the ones who initially dug out all the information above, all I’ve done is collate it together, make up some diagrams and write the guide. If you do have any issues with this conversion, the forums are the place to ask.